Need to add an extra touch to your project? Appliques are great for that! They are quick to crochet and you can attach them to just about anything. Whether it’s a plain blanket, hat, scarf for bag, add an applique to it! 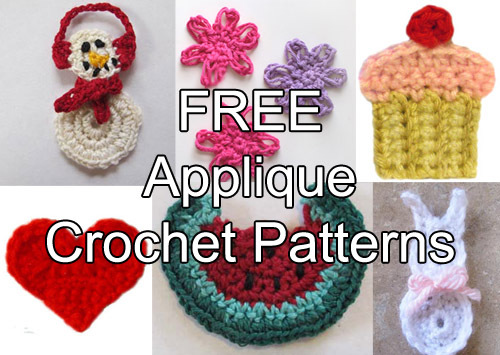 In this post I rounded up a few free crochet patterns that we’ve published here on Crochet Spot over the years. Need an applique pattern that’s not on the list? Let us know in the comments below and we might just make it for you! This entry was posted on Thursday, August 10th, 2017 at 12:00 AM by Rachel Choi	and is filed under Best Crochet Patterns, Free Crochet Patterns. You can follow any responses to this entry through the RSS 2.0 feed. You can skip to the end and leave a response. Pinging is currently not allowed. Your patterns are wonderful, I just wish you could offer them in knit as well. The Halloween bow I think is a great idea. I think knitters can easily adapt that to knit.